Elizabeth, New Jersey is honored to be the newest addition to Royal Caribbean Cruise Line excursion offerings. Elizabeth is the ideal location for Royal Caribbean’s new expansion of excursions into the NY- Metro area~!!! This October 2017 marked a milestone in New Jersey State tourism history. Expanding for the first time ever in its history of tourism for the state, a major cruise line now has excursion opportunities for passengers to discover one of New Jersey’s oldest and most historic cities, Elizabeth. “The Elizabeth DMO has aggressively pursued sales and product development initiatives since it was formed in 2015. The addition of the first-ever cruise excursion in New Jersey’s Gateway Region is one of the organization’s most exciting successes to date,” said New Jersey Division of Travel and Tourism’s Acting Executive Director Jake Buganski. 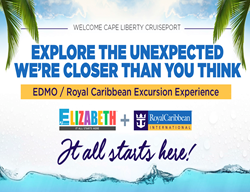 Specifically, with the new partnership of EMI Global, Royal Caribbean Cruise Line (RCCL) passengers now have the option before returning home, to continue their vacation experiences and embark on an exciting journey to explore New Jersey’s newest destination, Elizabeth. Groups Today Magazine voted Elizabeth, NJ as one of top 10 emerging destinations. Elizabeth is known for its historical precedence of being the starting point for New Jersey (est. 1664) and home of America’s founding fathers, like Alexander Hamilton, Elias Boudinot, Marquis de Lafayette and many others. Additionally, Elizabeth is noted for its rich ethnic diversity (representing more than 50 countries and 37 language groups), authentic cultural cuisine, and as being the 5th best City for Shopping in America due, in part, to being the location of New Jersey’s largest outlet and value retail center, The Mills at Jersey Gardens, a Simon Center. With its convenient location, Elizabeth sits at the gateway to the state of New Jersey. Just minutes from Cape Liberty Cruise port, Newark Liberty International Airport (EWR), and all mayor roadways, Elizabeth is the ideal location for Royal Caribbean’s new expansion of excursions into the NY- Metro area. Elizabeth, New Jersey offers a vast area of experiences for enthusiasts who have limited time and want to explore just outside New York City. Conveniently located just minutes from Cape Liberty Cruise Port, Elizabeth is the ideal location to extend your vacation before or after your cruise with close proximity to Bayonne, New Jersey, offering 8 major franchised hotels (Country Inn & Suites, Courtyard by Marriott, Crowne Plaza, Embassy Suites, Hampton Inn, Hilton, Residence Inn by Marriott, and the Renaissance). For more information visit: http://www.GoElizabethNJ.com/RCCLExcursions or call the Elizabeth Destination Marketing Organization office directly at 908.355.9797.